The level gauge model BNA consists of a bypass chamber, which, as a communicating tube, is connected laterally to a vessel via at least 2 process connections (flanged, threaded or welded). Through this type of arrangement of the level gauge, the level in the bypass chamber corresponds to the level in the vessel. The float with a built-in permanent magnetic system, which is mounted within the bypass chamber, transmits the liquid level, contact-free, to the magnetic display mounted to the outside of the bypass chamber. In this are fitted, at 10 mm intervals, two-coloured plastic rollers or stainless steel flaps with bar magnets. 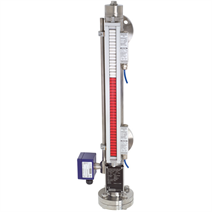 Through the magnetic field of the permanent magnetic system in the float of the level gauge, the display elements, through the wall of the bypass chamber, are turned through 180°. For an increasing level from white to red; for a falling level from red to white. 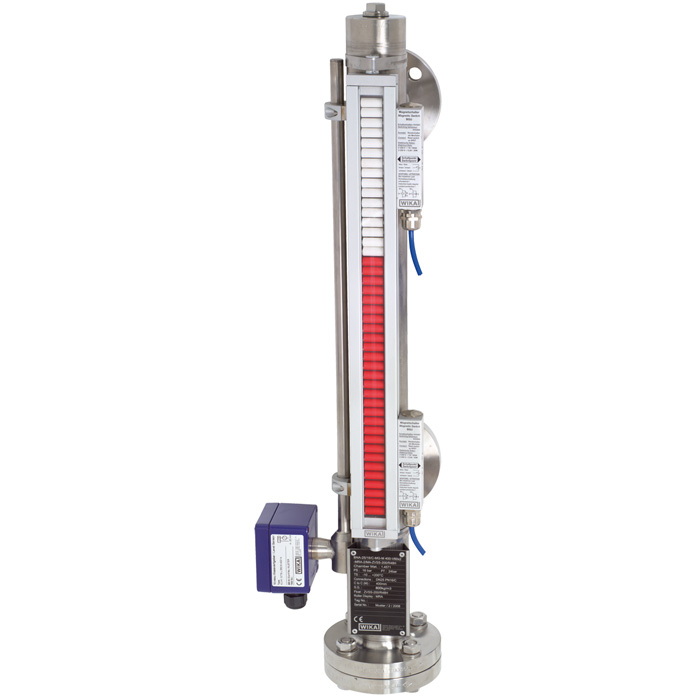 Thus the level gauge clearly displays the level of a vessel without power supply.